Just arrived is next weeks February 2014 Costco Coupon Book. Clicking the link above will allow you to view, download, and print the coupons if you’d like to. The January 2014 Costco Coupon Book is valid through Sunday the 26th, and the February coupons begin the following Thursday. One very interesting thing is that besides the tire and optical coupon, there are only 6 items that require a coupon, and they are all Proctor and Gamble products. So, that tells us that Costco would prefer that all products be Instant Savings and not require a coupon, but some manufacturers require Costco to require a coupon. However, not all P&G products in the book require a coupon, so perhaps only certain divisions of the company. 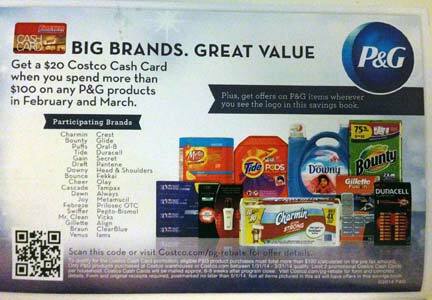 Lastly, you’ll see on the last page of the coupon book that Proctor and Gamble is offering a $20 Costco cash card when you spend $100 on P&G products at Costco during February and March. I see that as being difficult to achieve unless you buy something like a Braun electric razor or Iams dog food. This coupon book seems to be much better than last months. There are quite a few items that people are excited about. The Sonicare FlexCare two pack plus UV sanitizer and travel accessories is a great deal at $30 off. Also, the Duracell batteries are not on sale that often, and definitely better than the Kirkland Signature equivalent. The Mobil 1 motor oil is a great price after coupon at $10 off. As for myself, I will likely only get Airborne, since I am low and do feel that it has worked really well when I’ve taken it. I’m also surprised there’s only one TV in the coupon book that runs during the Super Bowl. I’ve always heard a lot of people buy TVs during this time of year, but maybe that’s not true. The tire coupon is once again Michelin, so I’m predicting March will be Bridgestone. You can download the Costco app if you didn’t get the coupon book mailed to you, and show the cashier your coupons from your phone. Also, at some locations the cashier will have the coupons already and automatically scan it for you. I heard they are getting more strict on this though. These coupons will not work in store, as you need the barcode. Remember, the booklet says that additional books will NOT be available at the warehouse, which is a change from the past. If you’d like to be notified as soon as deals come up, make sure to subscribe to our email list, like us on Facebook, and follow us on Twitter! Have you tried any of the items in this coupon book? What did you think? Click Read More to see a full list of items below. Wow! This blog really was helpful!